Doriane and Vincent came to all the way from Brussels, Belgium to tie the knot and get married in Montreal. They chose this lovely romantic city because they lived here for a year through their university exchange and decided that after 10 years together this is where they want to say “I do”. For their elopement, they invited 4 of their friends from university to join them at the “ Palais de Justice” and be witnesses to their beautiful celebration. The lovely bride and groom to be started their wedding getting ready at Hotel St Martin on Maisonneuve in downtown Montreal. They had a gorgeous suite with lots of large windows and natural light which is every photographer’s dream. 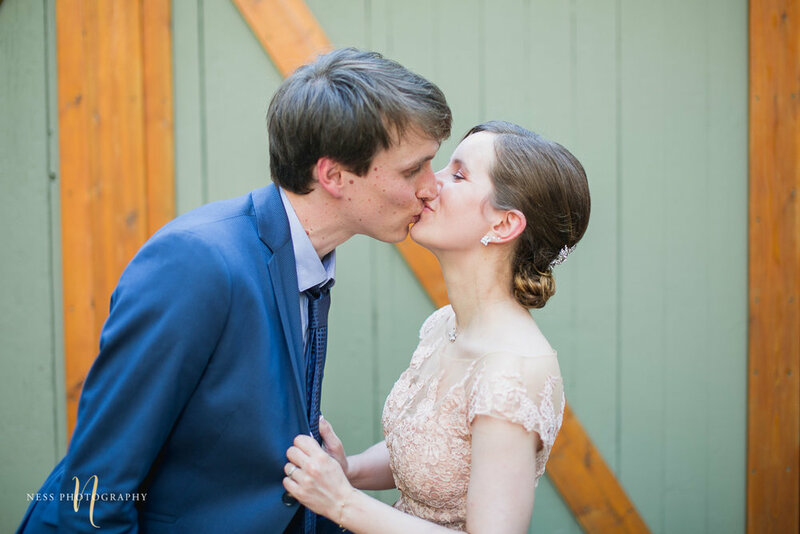 Choosing an elopement reflected the personalities of Doriane and Vincent , but also the little details in their wedding also spoke to directly to who they are. I especially love the blush dress the bride chose and the unique funky pink shoes that go with it. Following the preparations at hotel St Martin, we headed to the Palais de Justice for the actual elopement. Immediately after, we all headed for brunch together which was also a great down time for the bride and groom in a hot summer day (and you all know how hot it gets in Montreal!) and was a great time to also get ready for the bridal photoshoot right after. For their elopement bridal shoot, Doriane chose to shy away from the touristy old port and go instead to more unique cultural neighborhoods of Montreal. That is why we chose Square Saint-Louis (Carre Saint-Louis) in plateau Mont Royal (you might remember it from this proposal as well) because of its unique colors and buildings architecture. Following Plateau Mont Royal, we headed to industrial Lachine canal for some graffiti/street art covered buildings. To go with the industrial and rugged feel of the buildings in Canal Lachine area, the couple chose to also play with color smoke bombs which were fun to play with and added a unique feel to their images. If you are considering to incorporate smoke bombs to your wedding or engagement shoot, they will be the perfect pop of color in your photos.